Like moist, soft cookies? 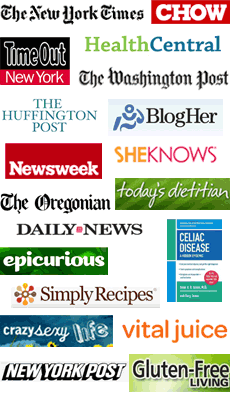 Send Dr. Laura an email (info@lauraswholesomejunkfood.com) with your name, mailing address and "CeliacChicks Cookie Giveaway" as the subject line. The first ten households to respond will be chosen to receive a free case of gluten-free cookies (six 6.5-7oz tubs) from Laura’s Wholesome Junk Food! Deadline to respond is May 10th. Please tell them in the body of your email what flavor you would like. Laura’s Wholesome Junk food was started by Laura Trice, M.D. because of her passion for great tasting food that was also healthy. Four of the ten Bite-lette flavors are gluten-free: Sally’s Raisin, Charlotte’s Chocolate Chip, Better Brownie, and the newest gluten-free Bite-lette, Cole’s Cashew Chocolate Chip. Cole’s has a rich cashew and chocolaty taste with a smooth texture that is less sweet than the other flavors, and has been described as, "totally yummy"! Independent laboratory tests on these gluten-free products show less than 5.0 ppm gluten. Products are manufactured on shared equipment that also processes wheat, dairy, eggs, nuts, tree nuts and soy. Products retail for $4.99 to $6.99 and are sold in over 500 stores nationwide, including Whole Foods Markets, Gourmet Garage, Food Emporium, Roots, Earth Fare, Harris Teeter as well as numerous other independent stores. For more information or to order directly, visit our website at www.lwjf.net. Cashew Choc chip…wow that’s the flavor I’d like! Gee, I don’t want to leave you stuck with all those cookies! I’d be happy to “help” you out :). I will be in that hood tomorrow, so, let me know what we can work out. Nothing like home cooking. The many benefits of home cooking include the joy of preparing a special dish that is nutritious food for your family. The satisfaction derived from knowing that you invested time and effort to lovingly prepare this home cooked meal, because you care, is invaluable.